- อารยธรรมวิลลาโนวัน 1200 ก.ค.ศ. 1200 ก.ค.ศ. - กลืนไปกับชาวโรมันโบราณ 550 ก.ค.ศ. 550 ก.ค.ศ. ↑ According to Félix Gaffiot's Dictionnaire Illustré Latin Français, Tusci was used by the major authors of the Roman Republic: Livy,Cicero, Horace, etc. A number of cognate words developed: Tuscia, Tusculanensis, etc. This was clearly the major word used for things Etruscan. Etrusci and Etrūria were used less often, mainly by Cicero and Horace, and without cognates. According to the Online Etymological Dictionary, the English use of Etruscan dates from 1706. ↑ Rasenna comes from Dionysius of Halicarnassus I.30.3. The syncopated form, Rasna, is inscriptional and is inflected. The topic is covered in Pallottino, page 133. Some inscriptions, such as the cippus of Cortona, feature the Raśna (pronounced Rashna) alternative, as is described in Gabor Z. Bodroghy's site, The Palaeolinguistic Connection, under Origins. ↑ A good map of the Italian range and cities of the culture at the beginning of its history can be found at , the mysteriousetruscans.com site. The topic of the "League of Etruria" is covered in Freeman, pages 562-565. The league in northern Italy is mentioned in Livy, Book V, Section 33. The passage also identifies the Raetii as a remnant of the 12 cities "beyond the Apennines." 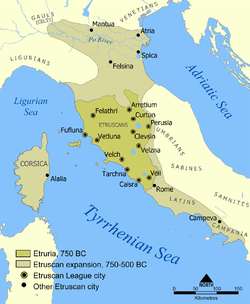 The Campanian Etruscans are mentioned (among many sources) by Polybius, (II.17). The entire subject with complete ancient sources in footnotes was worked up by George Dennis in his Introduction. In the LacusCurtius transcription, the references in Dennis's footnotes link to the texts in English or Latin; the reader may also find the English of some of them on WikiSource or other Internet sites. As the work has already been done by Dennis and Thayer, the complete work-up is not repeated here. ↑ Cary, M.; Scullard, H. H., A History of Rome. Page 28. 3rd Ed. 1979. ISBN 0-312-38395-9. หน้านี้แก้ไขล่าสุดเมื่อวันที่ 1 ตุลาคม 2559 เวลา 03:25 น.